2018 has been another extremely encouraging year for the Rangers Youth Development Company. On behalf of all our staff I would like to place on record my sincere gratitude to the thousands of Rangers supporters who take part in our wide range of products every week – which makes our annual contribution to the Rangers Academy bigger year after year. In January 2017 we were pleased to present the youth department with a cheque for £175,000, earlier this year that figure had increased to an impressive £250,000 and I am absolutely delighted to confirm we will donate £400,000 to the club’s youth programme next month. RYDC is proud to assist the Academy in any way we can and I know Craig Mulholland and his coaching staff are delighted with the level of support we are able to consistently offer. This money really does make a positive and tangible difference to youth operations at the Hummel Training Centre but it should never be forgotten that this is only made possible by the generosity of the Rangers fanbase worldwide. As Rangers Chairman Dave King rightly highlighted in his recent AGM speech, supporters show incredible backing for RYDC throughout every season and their participation in our ever-growing portfolio of products allows us to help the Academy further develop. I also thank the Chairman for his recognition of our work, it was greatly appreciated and has provided a welcome boost to all our staff. Like all fans, we love it when a youth player progresses from the Academy and pulls on the famous Light Blue jersey. There is nothing more satisfying than a homegrown player making the grade and graduating to the first team set up and we will continue to play a significant role in the funding of our youth programme. This season, it is clear that new manager Steven Gerrard and his backroom staff are more than willing to give youth a chance. A host of players have trained with the top team squad with winger Glenn Middleton, midfielder Stephen Kelly and striker Serge Atakayi all making competitive appearances. Glenn has made the most obvious impact this season – starting games, scoring goals and featuring in the Europa League – and his spell with the Academy in the early part of 2018 undoubtedly prepared him for the rigours of top flight football. 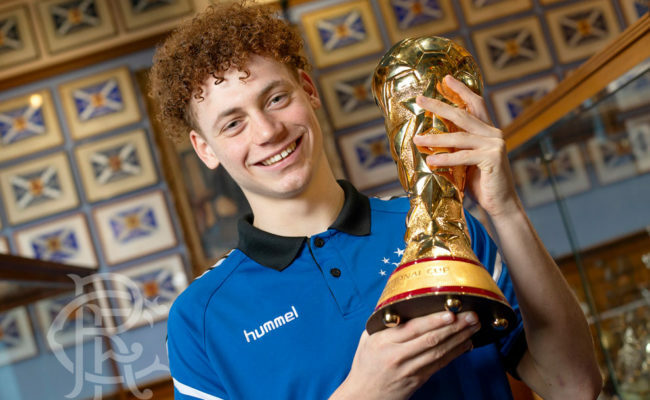 Ross McCrorie made the same breakthrough a year earlier and there are a number of other Academy prospects that have a great chance of following in their talented footsteps. 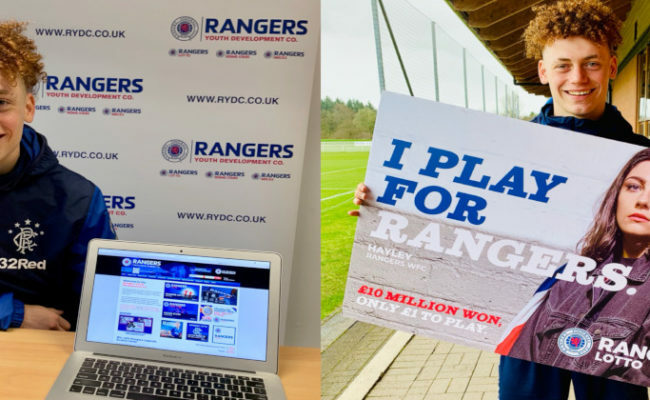 Ross accepted our £250,000 donation on behalf of RYDC in January and he also kindly assisted us with the launch of our Rangers Lotto ‘I Play for Rangers’ campaign in the summer. Rangers Women’s Team Manager Amy McDonald and player Sarah Robertson joined fans Cheryl Marshall and Karen Watson at the training ground to unveil a new advertising campaign. They all took part in a photoshoot at Ibrox Stadium for Rangers Lotto and the moody images featured in subway stations and carriages around Glasgow and billboards at the stadium. It was a huge success and raised awareness of one of our signature products. I thank Amy, Sarah, Cheryl, Karen and all the other players who donated their time to promote RYDC. Another important milestone for us in 2018 was the relaunch of Rangers Pools. 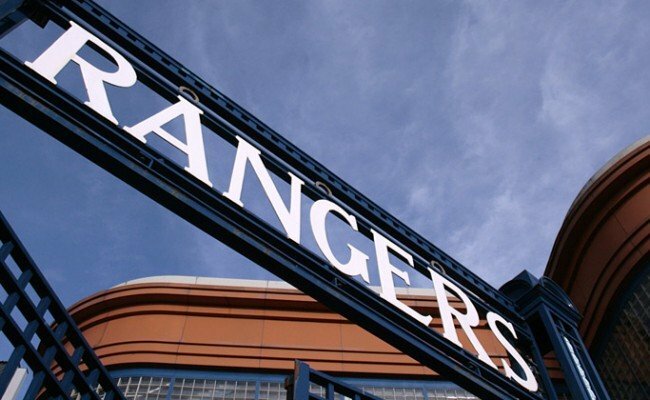 Former Light Blue stars Peter Lovenkrands and Gregory Vignal fronted the modernised partnership with the Football Pools and all profits will be donated back to Rangers Football Club exclusively for the maintenance and upkeep of Ibrox Stadium. Academy coach and former midfield star Kevin Thomson then further assisted us with a media launch promoting a brand new Apple and Android app which makes it even easier to play – and remember a minimum of 30p from every pound generated goes back to the Club for Stadium maintenance. Thanks again to all supporters who have backed this fresh initiative. More than 2500 supporters have already signed up and we hope to reach 5000 subscribers by the end of the season. When you sign up the first four games are free and there are up to 12 chances a month to win the jackpot prize of £3 million. An important element of our yearly promotion is the regular Twitter Q&As we host with Academy coaches and players and this has become hugely popular with supporters. In 2018, youth chief Craig Mulholland, youth goalkeeping coach Graeme Smith, Loans Manager Billy Kirkwood and youth players Jordan Houston, Zak Rudden, Cammy Palmer, Andrew Dallas, Jack Thomson, Kieran Wright, Aidan McAdams, Ryan Hardie, Stephen Kelly, Glenn Middleton, Kyle Bradley and Lewis Mayo all took part and provided an insight into what life is like as a young Ranger. We had a special Glasgow Cup Final winning Q&A with coaches Brian Gilmour, Malky Thomson and captain Danny Finlayson after their victory over Celtic and Director of Football Mark Allen recently gave up his time to answer fans’ questions for RYDC. Barcelona Bear Derek Johnstone also took a trip down Memory Lane with a fans’ Q&A – as did Andy Little just before Xmas – and my thanks go to Mark, Craig, Graeme, Billy, Kevin, Peter, Gregory, Brian, Malky, DJ, Andy and all the youth players for their support. We will have further Q&As with youth coaching staff and players throughout 2019. We are delighted to work so closely with the Rangers Academy and I must conclude by paying tribute to the Rangers Charity Foundation who helped raise £32,000 for RYDC with a high profile charity match at Ibrox in late March. 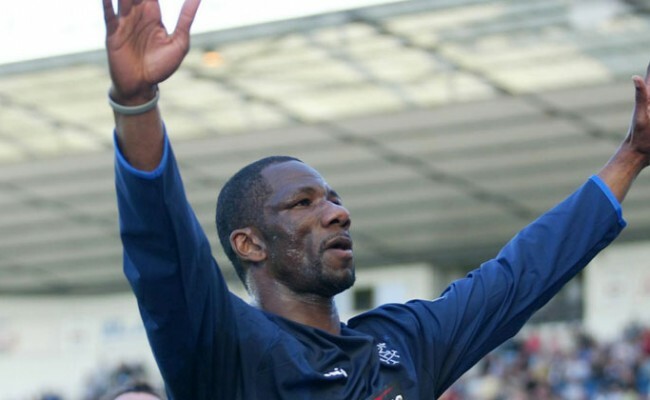 A host of former players helped us promote the game with Twitter Q&As – Craig Moore, Lee McCulloch Charlie Miller and Bob Malcolm – and the Foundation was able to donate a terrific sum which will ultimately support the youth programme. Thanks to Connal Cochrane and the Foundation staff for their efforts in putting on this fixture. Finally, thanks to Rangers CEO Stewart Robertson and the Rangers Board for their support and again my thanks go to all the fans and Lotto agents who continually back RYDC. Since 2002, RYDC profits have been directed to Rangers Football Club’s youth programme and we have provided more than £7.5 million in that time. For full details on all our products – the re-launched Rangers Pools, Rangers Lotto, Rising Stars, Scratchcards, Stadium Bricks and the Youth Members Club – visit www.rydc.co.uk or call0141 427 4914. I wish you all a Merry Christmas, a Happy New Year and best wishes for 2019 and beyond.